Every time we turn on the TV or go on social media, we are inundated with photos of dogs photos or videos showing clever dogs, cute dogs, silly dogs, lovable dogs and so on. A dog is without a doubt a treasured & much loved part of the family and lots of us think we couldn’t live without our dog. Well this is actually the case for many people who live with conditions such as type 1 diabetes, narcolepsy, Addison’s disease, PTS and even severe nut allergies. Like you, I watch all the videos on social media and I know how extremely cute, lovable and clever dogs can be but nothing prepared me for what I would learn when I was introduced to Medical Assistance Dogs. The charity was co-founded in 2008 by a group of people including a behavioural psychologist and a former orthopaedic surgeon. Both were convinced dogs could be trained to detect the odour of human cancer and after two very successful scientific investigations, they have consistently achieved 93 per cent reliability in training trials. 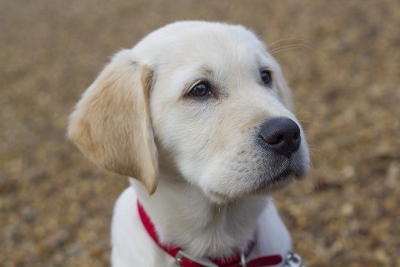 With the facts that one in two people born after 1960 will be affected by cancer in their lifetime, diabetes is on the rise and the well-known challenges facing the NHS, the work by Medical Detection Dogs is much needed. I was lucky enough to attend a demonstration day at Medical Detection Dogs headquarters in Great Horwood where I heard all about how the charity was founded. I then witnessed the most amazing demonstration of the Medical Detection Dogs at work. The dogs are trained to detect the odour of cancer volatiles in samples from patients, currently urine & breath samples. In the detection room is a large metal carousel which holds 8 samples. The containers with the samples in are put on the ends of each of the numbered arms of the carousel, one of the samples is a positive sample from a cancer patient. We were told which number sample the positive one was. The dog was then brought in by its handler. When told, the dog goes to each of the containers and sniffs each sample. When it finds the positive sample, it stops and sits down to indicate a positive find. We watched four separate demonstrations, all with a 100% success rate. When no positive samples are detected, the dogs are trained to just walk away. I was completely blown away by what I saw and it was actually quite emotional. The research by Medical Detection Dogs has also shown that dogs can be trained to detect other human diseases as well as cancer. Since 2008, Medical Assistance Dogs has also trained alert assistance dogs for people with life-threatening conditions, giving them greater independence and sometimes saving their lives. The Alert Assistance Dogs help people with very complex medical conditions who often have no warning signs or awareness of an impending life-threatening situation. The dogs are trained to detect minute changes in the sufferer’s odour and alert them to take preventative action. One lady I met, Carolyn who suffers from a severe form of type 1 diabetes told me that her dog Simba, alerts her when she is sleeping by actually sitting on her to wake her up and even going as far as bringing her blood kit! Before Simba came along, Carolyn was being admitted to hospital 3 or 4 times a week after falling into coma after coma. She couldn’t leave her house for fear of suffering a hypo or hyper. Since having Simba, Carolyn hasn’t been hospitalised once due to her daibetes and is able to live the life she always wanted. If it wasn’t for Simba, Carolyn wouldn’t be alive today. Medical Detection Dogs are proud to have a ‘NO KENNEL’ policy which means all of their dogs live in a loving home environment before being partnered with a client. By increasing the number of assistance dogs placed with clients year on year will bring down their waiting list and will speed up the process of offering support to those individuals living with these medical conditions. Have the ability to travel to classes at the centre or local area once a month? Medical Detection Dogs provide food and equipment for the puppy and cover all veterinary costs whilst the puppy is with you. Support and advice is provided.